Baby pumpkin onesie cookies and baby face sugar cookies are great for surprising a mother-to-be this autumn. 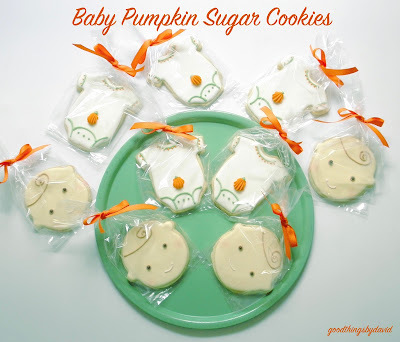 These cookies are so adorable and easy to make, that you're going to want to bake dozens of them for the expecting mother's baby shower. 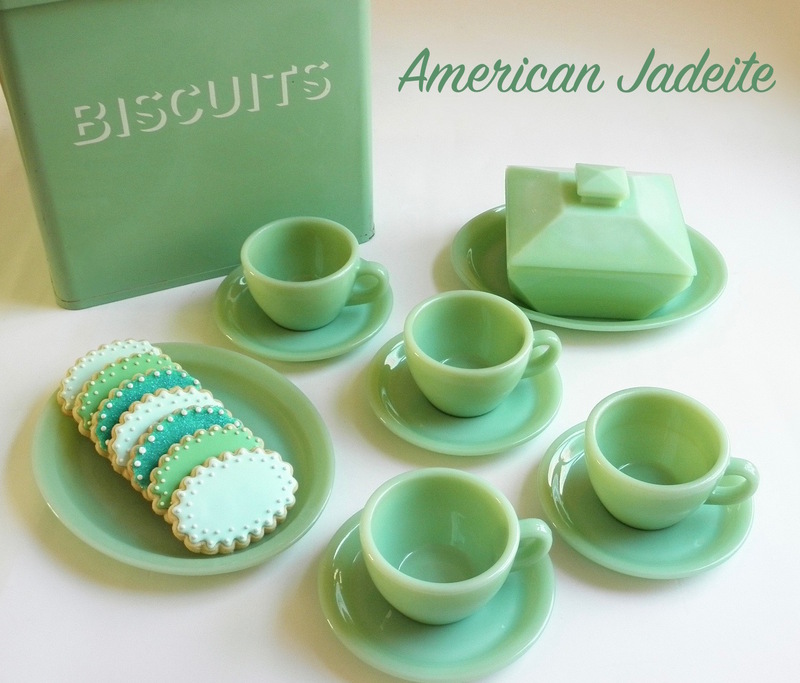 Find appropriate cookie cutters, some good recipes for sugar cookies and royal icing, and set aside a day or two to pipe the simple designs onto baked and cooled cookies. From the designers and coppersmiths at CopperGifts, the baby face cookie was made with the boy cutter from the Baby Face Boy and Girl Cookie Cutter Set. The cute onesie was made with the Baby Onesie Cookie Cutter. 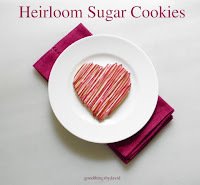 I used my heirloom sugar cookie recipe and my royal icing recipe (use the search engine on the blog to find the recipes) for the cookies you see here. Once the cookies had been baked and cooled, I mixed small batches of royal icing in ivory (baby face), light brown (baby eyes and hair), light pink (baby's mouth), avocado green (onesie detailing), and pumpkin (for the pumpkins and onesie detailing). 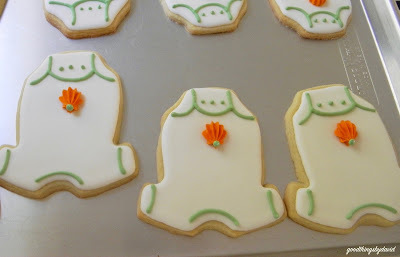 White royal icing was used for the bodies of the onesies. For the onesies, outline and flood the bases of the cookies in white royal icing; let dry completely. Using the avocado-green royal icing and a #2 piping tip, pipe beads of icing for the arms, neck and leg lines of the onesie, and pipe dots for the onesie snaps as shown. Using a stiff royal icing tinted a pumpkin color (orange mixed with a tiny amount of brown) and a #22 open-star tip, pipe small "pumpkins" toward the bottom of the onesie as shown. Hold the piping bag at a 45-degree angle to get the correct shape of the pumpkin. Using a cookie decorating pick with a spade end, push the tips of the "stems" of the pumpkins downward, so that they don't stick out. 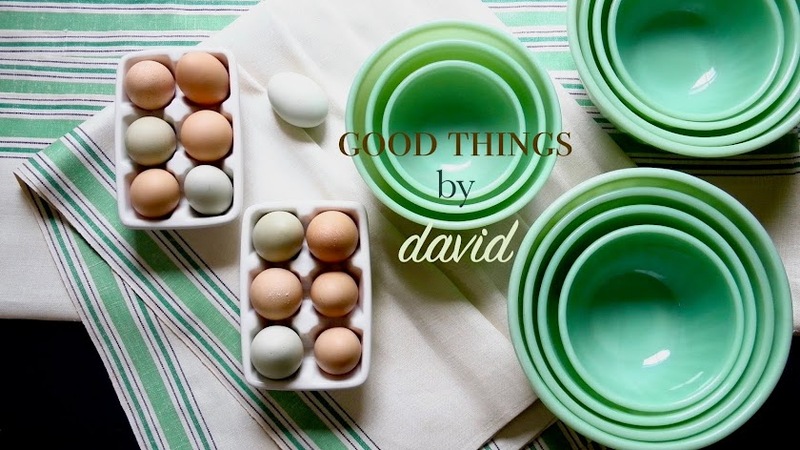 Using the avocado-green royal icing and a #2 piping tip, pipe dots for the stems of the pumpkins as shown. Let dry. 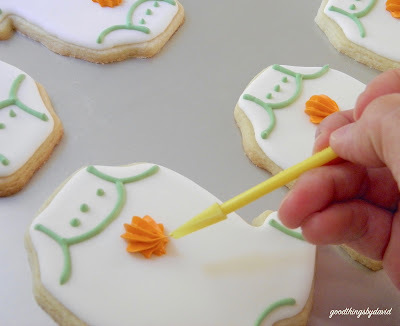 Using the pumpkin-colored royal icing and switching to a #2 piping tip, pipe dots along the neck and arms of the onesies as shown. Let dry. 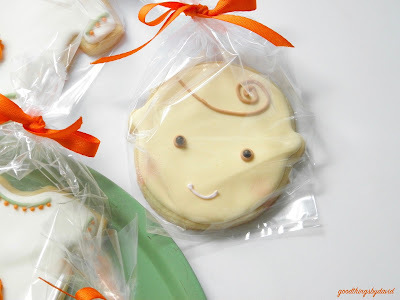 As soon as the cookies have dried completely, package them up in clear cellophane bags and tie them with a colorful ribbon. Easy! 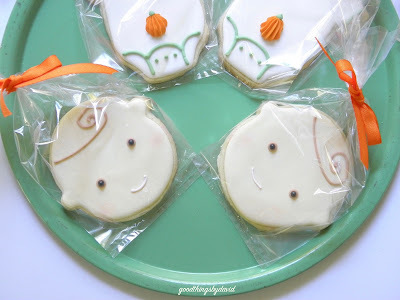 For the baby face sugar cookies, outline and flood the bases of the cookies in ivory-colored royal icing using a #4 or #5 piping tip; let dry. Using the light-brown royal icing and a #2 piping tip, pipe the swirly "hair" onto baby as shown, and pipe two dots for the irises of the eyes. Immediately place black pearl candies in the centers of the eyes to create pupils. Using the light-pink royal icing and a #1 piping tip, pipe a small smile onto the baby's face as shown. Let the icing dry completely. Last, but not least, use a little bit of pink petal dust and a very fine paint brush (keep brushes exclusively for cookie decorating) to apply the tiniest amount of blush onto the baby's face. Cuteness!! The cookies are now ready for packaging. How easy was it to decorate these little cutie pies? 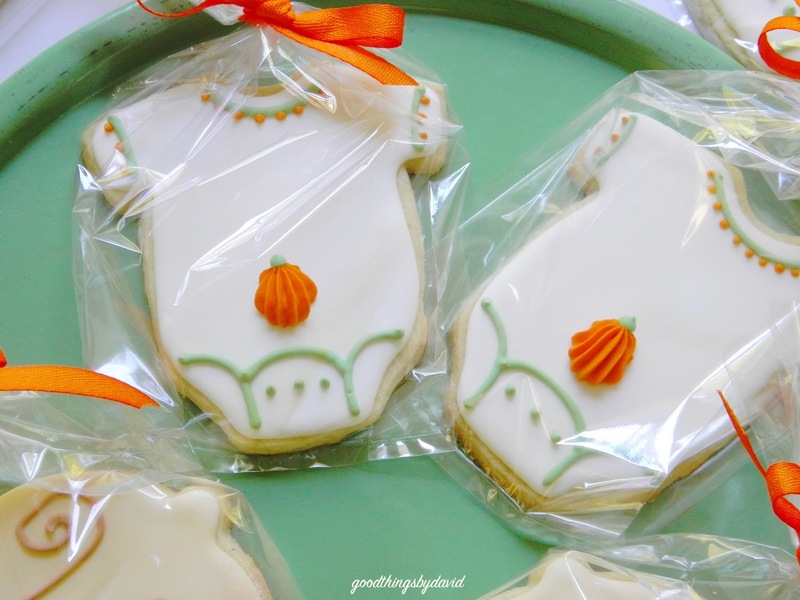 It's hard to resist baby pumpkin onesies and baby face cookies. 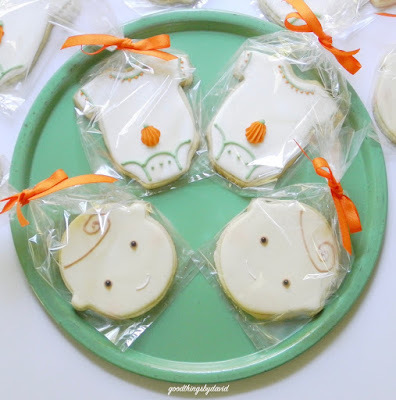 There is no reason to stick with the standard light pink or light blue for a baby shower. Made this way, and by using an autumnal color palette, you can make the cookies in keeping with the season. It's a good thing too, especially if you don't know if the baby is to be a boy or a girl. Keep them guessing right up until the end! CUTENESS is the right word!